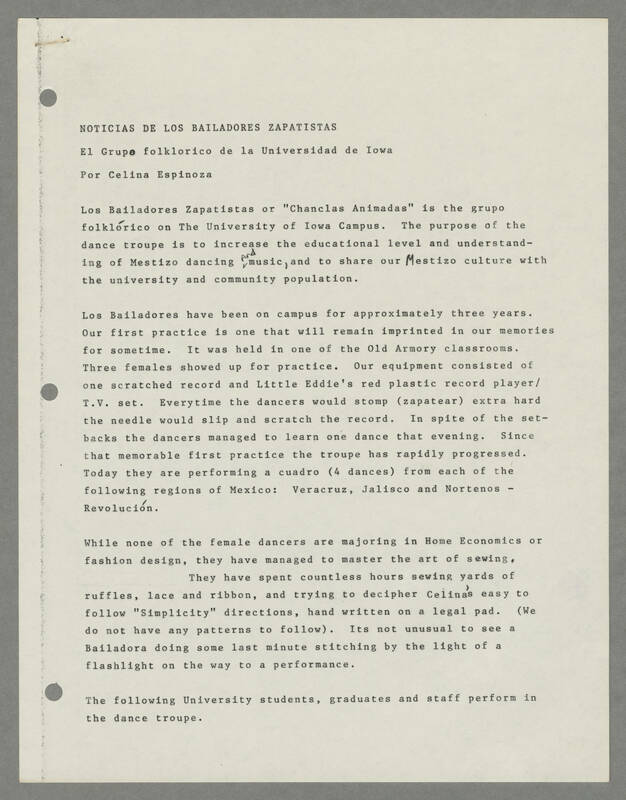 NOTICIAS DE LOS BAILADORES ZAPATISTAS El Grupo folklorico de la Universidad de Iowa Por Celina Espinoza Los Bailadores Zapatistas or "Chanclas Animadas" is the grupo folklorico on The University of Iowa Campus. The purpose of the dance troupe is to increase the educational level and understanding of Mestizo dancing and music, and to share our Mestizo culture with the university and community population. Los Bailadores have been on campus for approximately three years. Our first practice is one that will remain imprinted in our memories for sometime. It was held in one of the Old Armory classrooms. Three females showed up for practice. Our equipment consisted of one scratched record and Little Eddie's red plastic record player/ T.V. set. Everytime the dancers would stomp (zapatear) extra hard the needle would slip and scratch the record. In spite of the setbacks the dancers managed to learn one dance that evening. Since that memorable first practice the troupe has rapidly progressed. Today they are performing a cuadro (4 dances) from each of the following region of Mexico: Veracruz, Jailisco and Nortenos - Revolucion. While none of the female dancers are majoring in Home Economics or fasion design, they have managed to master the art of sewing. They have spent countless hours sewing yards of ruffles, lace and ribbon, and trying to decipher Celina's easy to follow "Simplicity" directions, hand written on a legal pad. (We do not have any patterns to follow). Its not unusual to see a Bailadora doing some last minute stitching by the light of a flashlight on the way to a performance. The following University students, graduates and staff perform in the dance troupe.